Off-Season Football Training: A Sample Program! In this article we will talk about a 3 day per week routine that centers around squatting and pulling. If you weren't gaining before then this will be your ticket to gain mass and strength. Try it out! Everyone has to start somewhere. I was lucky to get my start in a good place. When I was in high school, I subscribed to Ironman magazine and Muscle Media 2000. Both magazines ran a similar article by Bill Starr. Bill Starr was a strength coach and former Olympic lifter and powerlifter. In this article, he talked about a 3-day per week routine that centered around squatting and pulling. It was extremely basic but it worked wonders for me. I have given similar programs to beginners in the past and the results have been nothing short of fantastic. Starr gave many reasons why this was a great program. First of all it's extremely simple and easy to follow. It also relies on compound movements so you do not need a lot of fancy equipment. The last reason is that it has built-in variation and progression. You will get stronger every week on this program. It works on the Heavy, Light, Medium day schedule so it's important that you do not miss any days. Starr's philosophy was simple. If you get strong, the size will come. I tell my athletes all the time that all the squatting and pulling we do will make you big all over. Just think to every 700-pound and above squatter you have ever seen. Were they small or did they have big arms? This type of training is great for football players. Most players are in desperate need to gain functional muscle mass. This program will do just that. Not only will you get bigger but your strength and explosiveness will be greatly enhanced. Monday Full Squats 5 5 Do 4 progressively heavier sets of 5, with the 5th set being your 5RM. Wednesday Light Squats or Lunges 4 8 Each leg. Shoulder Press or Dips 5 or 4 5 or Max If doing dips, go until you get 12 each time. Then add weight. Friday Full Squats Warm-up to 3 reps with 5 more lbs than you used on Monday. On the following Monday use this weight for your 5th set. Click Here For A Printable Log Of This Sample Routine. The warm-up sets are just as important as they contribute to the overall volume. You will do this same progression every where you see 5x5. Squats are the only exercise that progress differently from week to week; more than the others. On the other exercises you simply add 5 pounds. every week. For squats you will work up to a 5RM on Monday. Then on Friday you work up the same way until set 4. When Monday comes back around, you simply try to do your 3RM for your top end set of 5. It seems hard to go up 5-10 pounds every week, but everyone I have ever seen try this, has done just that. I went up 10 pounds every week for 12 weeks the summer before I went to college. Once you get a little more advanced, you might need to change things up a bit. The summer before I went to college, I really needed to increase my power clean for football. You could also make the following change for deadlifts.Don't be afraid to change up some of the exercises, but keep the basics the same. If you want to do chin-ups instead of pull-ups, that's okay. 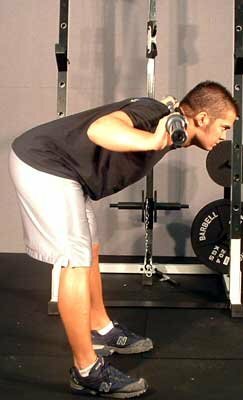 High Pulls or Shrugs are good substitutes for bent over rows. You can do abs whenever. I do them before workouts because if I don't, I'll leave without doing them at all. Click Here For A Printable Log Of This Variation Routine. This variation allows you to spread out the heavy work over the course of the week. This might be more beneficial for the intermediate or advanced lifter. It is important to limit your activity on "off" days. I am not a huge fan of extra workouts for most people. I know lifters who go both ways on this issue, but I believe that too many extra workouts have a detrimental effect on the rest of the workouts that week. On the off days you can do some light activity, but keep it simple. You will be working your legs 3 times per week, so extra running or aerobic activity will probably have a negative effect on your workouts. Give this program a try for a few weeks. All the pulling and squatting is sure to add tons of muscle to your back and legs and as we should all know by now, those are foundations you can build on. Jay Floyd earned his B.S. in Exercise Science and his M.Ed. in Physical Education from Columbus State University. He works as a Strength and Conditioning and Football coach to high school athletes. He is also a competitive powerlifter with personal meet bests of an 800 squat, 450 bench, 633 deadlift and 1850 total at 275. Jay gives all the credit for his success to Jesus Christ who blesses him every day. Jay Floyd graduated from Columbus State University with a B.S. in Exercise Science and a M.Ed. in Physical Education.